On our recent trip to St Johns, one of the Virgin Islands named after nuns by Columbus-check), we expected to relax, get some sunshine, snorkel and hike. And we did all that. We also found ourselves in an uncomfortable relationship with some creatures we’d not yet experienced prior to our trip. At night in our bed, on the beach and in our little rustic cabana, we fast became food for Noseeums. Noseeums are annoying tiny black bugs that are so small you often don’t see them (hence the name). They are also referred to as sand flies, vampire bugs and . We are used to mosquitos and those bugs can be very painful and annoying as well. But unlike mosquitos that tend to bite in solo, noseeums seem to attack in groups. So bites may be 5-7 in a row perpetuated by a “gang” of marauding noseeums, young insects out on the town and up to no good (from our perspective). Unfortunately, the St. John police department did not put out an APB on our behalf. But the noseeums were in all their glory. By the end of the trip, we’d learned that lemon eucalyptus helped to ward off the bugs at night and is less toxic than DEET. A fellow traveler also told us that baby oil applied liberally all over our bodies also helps keep the noseeums from landing and biting as well. (But baby oil and suntan lotion don’t mix so this was only helpful at night!) Each morning we’d have to scrub off the baby oil, then lather on the sunscreen and lemon eucalyptus before heading out the beach. After we got out of the water, we did apply some DEET, especially as the afternoon sun began to set. But any time we stood a few minutes anywhere on the beach, near the beach, or even when we were walking away from the beach, the little blood suckers let us know it was their island and we were only their to be their next Happy Meal. St John‘s history is a bloody sad tale of slaves from Africa being bought from warring African tribes that sold their conquered enemies into slavery to the Dutch and Danish settlers of St. John and St. Thomas. The settlers then transported the unlucky people to St. John. Many slaves perished due to the tough living conditions of the island (No DEET back then!) and rough treatment by slave owners. My boyfriend and I wondered if the noseeum infestation was actually caused by the spirits of dead slaves getting their revenge. Locals said the noseeum infestation was more likely caused by recent heavy rains and cooler weather. “The Skinny on Noseeums” a great post from a Undercurrent.org a webzine about serious divers. I’m not a diver, but the article’s noseeum advice was rather sage so I thought I’d pass along the link. Click here to read what Undercurrent.org authors have to say about the possible diseases carried by and ways to diagnosis illness from noseeum bites. Yet more noseeum info here. To read about the potential dangers of DEET click here. 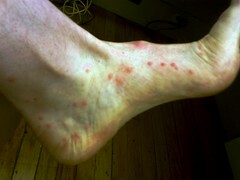 For an article called, “Whats more dangers DEET or insects?” click here. And for our next warm weather trip, we’ll be taking calamine lotion, DEET, Lemon Eucalyptus oil and lots and lots of Solarcaine with Aloe!